The Volunteer Manager for Far West Local Health District has been awarded the top honour in her category at the 2017 NSW Volunteer of the Year Awards held in Sydney. Mrs Mary Leehane won the 2017 NSW Volunteer of the Year Award for Excellence in Volunteer Management, from two other finalists, at an awards ceremony held in Sydney on Friday (8 December). Far West LHD Chief Executive, Stephen Rodwell, congratulated Mrs Leehane on winning the top honour in her category at the awards. “On behalf of the District I wish to congratulate Mary on a very well deserved recognition for all her hard work and dedication in looking after our many volunteers,” said Mr Rodwell. “We value all our volunteers and I know that Mary especially enjoys her role as Volunteer Manager for the District. The great efforts and commitment to the organisation by our volunteers is a reflection of Mary’s role and her exceptional work in ensuring they are well looked after. “Our volunteers are in very good hands and they, along with the LHD, can boast they have the best manager in the State,” said Mr Rodwell. The Far West LHD was also represented at the Awards by Mr Timothy O’Neil, who was Regional Adult Volunteer of the Year winner and a finalist in the awards in that category. Mr O’Neill (Manager Nursing Leadership & Workforce Development at FWLHD) volunteers as a member of the LHD’s Patient Family Support Staff Volunteer Team. The Far West LHD also wishes to acknowledge Rex Airlines for their generous sponsorship in providing two return flights in recognition of the contribution of our volunteer services to Far West Local Health District and the communities it serves. 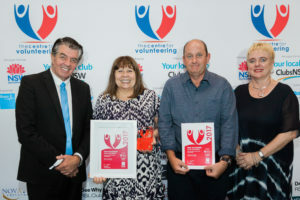 The NSW Volunteer of the Year Awards is an annual program run by The Centre for Volunteering to recognise the outstanding work of volunteers in every region across NSW. Twenty award ceremonies were held across NSW where nominees were recognised with certificates and winners announced. Regional and corporate winners went into the running for the overall NSW Volunteer of the Year Awards which were announced at a gala event held in Sydney on Friday 8 December 2017. NSW Volunteer of the Year Award for Excellence winner in Volunteer Management, Mrs Mary Leehane (second from left) and awards finalist, Mr Timothy O’Neil with (far left) Minister for Multiculturalism and Minister for Disability Services, the Hon. Ray Williams and CEO of Centre for Volunteers, Gemma Rygate. Photo by Susan White.